The Sazerac, which some say is America’s first cocktail, was invented by Antoine Peychaud, a Creole pharmacist, in the 1830’s. The original contained Brandy (some argue Cognac), Absinthe, and the Apothecary’s secret bitters, which now bear his name. Sazerac lovers all have their own recipe which they think is the best, which is ridiculous, because mine is the best. My buddy Tom also shakes a great Sazerac, he uses Wild Turkey Rye 101. In addition to recipe, an equally ferocious debate, is which bar in New Orleans has the best. I’m sure the locals may know better, but I think a great one is at the Fairmount Hotel’s, Sazerac Bar. The Fairmont Hotel, which was the Roosevelt until 1965, was owned by Seymour Weiss, friend of former Governor and later Senator Huey P. Long, who set up shop in the hotel. Anyway, they make a very good Sazerac, as well as their famous Ramos Gin Fizz, but that’s another post. It is a great little bar to relax and sample some of the fine cocktails of New Orleans. I haven’t yet heard the state of the Fairmont post Katrina. Great places for a Sazerac on Bourbon are the Desire Oyster Bar (recently re-opened) or Felix’s Restaurant and Oyster Bar, and of course Galatoire’s. Galatoire’s makes a Sazerac, as well as what they call a Galatoire’s Special which they mix the same, but substitute Bourbon for the Rye. about 1/4 ounce Herbsaint or Pernod. Chill an old fashioned glass. Combine the Rye, bitters and simple syrup in a cocktail shaker with ice. Shake well. Rub the rim of the glass with the lemon peel, then coat the inside of the glass with the Herbsaint, pour out the excess. Add the mix to the glass, twist the lemon peel and drop it in. Enjoy! If you have a high-end liquor store in your area, they will probably carry them. 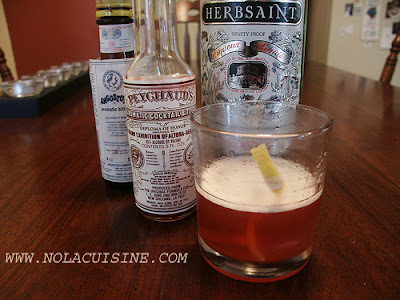 Although you can substitute Pernod for the Herbsaint, Peychaud’s are a must. I beg to differ on use of rye whiskeys being used over good southern bourbon in a Sazerac Cocktail , I tended bar in the French Quarter in the ’70’s , before that I was one of the first bartenders when Virginia legalized spirits by the glass in restaurants ….but my best learning experience came in Greenwich Village , NYC at then famous nightclubs “Your Father’s Mustache” (later I worked at the NO club on Bourbon St.)and Trudy Heller’s but the bartender experience started as a Cook at the Riviera Cafe ( still there today )Watching the guys at the Riv assert all the traits of what a good barman should be ; a dilettante , jack of all trades , entertainer and counselor…my biz card was done by American Calligrapher Master Ward Dunham , now of SF,Ca. A regular bartender only one nite a week at Enrico’s on Broadway too, one of the great bars & restaurants in America owned by Enrico Venducci (former owner of “the HuNgrY i”,where Bill Cosby & Smothers Bros. got starts) S , now that I’ve given my references please edit your post to address this as your recipe…the lemon peel is a whole lemon peeled curling around rested on the rim ! Just kidding but true recipe !! !